Recently, on a Friday, the Green Team held a harvest lunch. At morning tea time, the team picked beans, cherry tomatoes, broccoli, courgettes, and dug some of their purple heart potatoes and new carrots. At lunch time they set to work preparing the vegetables for the huge “Green Team Flan”, with side dishes of boiled potatoes, lovely carrots and cherry tomatoes. This was cooked in the hall oven and then eaten outside, picnic style, in the shade next to the vegetable garden. Delicious yummy and very colourful!! The flan was a big success and ‘seconds’ were in hot demand. The carrots were sweet and tasty. The potatoes were interesting as they were dark purple when dug, but faded to a very light mauve when cooked. 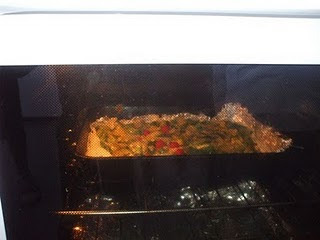 “Not as nice as our other potatoes”, (Jersy Bennes) was the verdict, “but still yummy”. Slivers of our garden strawberries followed. On the following Monday morning there were several reports of variations of the G.T. 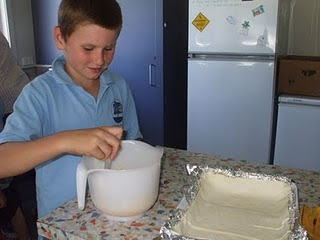 flan being made in the Addington community. 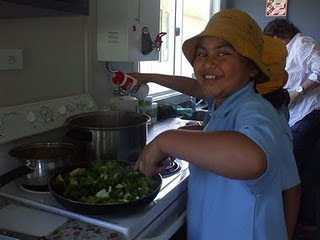 Great fun, gardening and cooking! 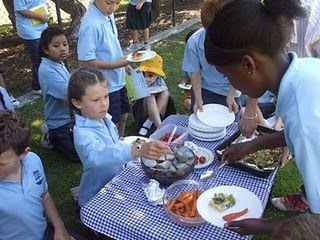 The team are planning another feast later in the term. Vandals have smashed the pumpkin crop during a recent weekend. Other produce has also been stolen. This is very disappointing for the children, as they were planning several soup lunches for the whole school later in the autumn. The culprits have been identified and are being dealt with by the police. Regardless of these events, the children at Addington school continue to put a lot of heart and soul into these gardens, and are hugely enthusiastic and positive about its potential. We will keep planting and sowing, learning and sharing with our school community. Roll on the next harvest feast!!! Hello Green Team. Your flan sounds really nice. Any chance of posting the recipe? Always looking for something that my children will eat.